Holidays to Greece and her many islands can be absolutely magical, and the amazing food plays such a big part in those memories you’ll come home with. One way to keep the holiday going for a bit longer is to throw a Greek-themed dinner party. Why not invite family or friends and, for one night only, transport them all to warmer climes. Though arguably there is finer wine in the world, you can bring a touch of authenticity to your dinner party with some local Greek wine, whether you bring it back from your holiday or track it down in your local supermarket. Many of the islands have their own local labels. Retsina, a traditional Greek wine with a pine aroma is a particularly good one to serve with appetisers. Ouzo is another famous Greek aperitif, distinguished by its strong aniseed flavour. At 80% proof, you’ll want to mix Ouzo with water to ensure your guests make it to the end of the dinner party. Greek appetisers are delicious, versatile and easy to buy if you don’t want to go to the trouble of making your own. Along with flat bread, tzatziki, hummus and taramasalata you can serve some more exciting fare, like dolmades (stuffed vine leaves), cheese-stuffed pies and feta cheese drizzled with Greek olive oil. Encourage your dinner guests to dig in to a little bit of everything – sharing is half the fun here. You’ll be spoilt for choice for Greek main dish ideas. Traditional moussaka, made with lamb mince is a good, hearty option for a winter’s evening, as are some of the local specialities like Kefalonian meat pie, made with suet pastry and, often, rabbit. Another good choice is pastitsio, a mince-based baked dish made with béchamel sauce. A summer affair might lend itself better to souvlaki (succulent kebabs), or even a slow roasted spring lamb served with herbs and potatoes. 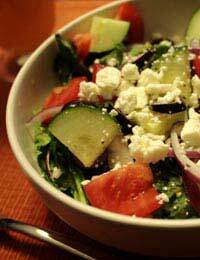 Fish is big in Greek cooking, too, as are vegetable dishes, so catering for all tastes will be easy. Greek desserts are also plentiful, with options as simple as delicious, creamy Greek yoghurt with local honey. For a more visually impressive and sugary dish, think about serving baklava (honey and nut-filled filo pastry) and kataifi, made with pistachio nuts, filo pasty and yes, you’ve guessed it, more honey. Though small, you won’t need many of these to feed your guests, since they are very sticky and rich. Think about rounding the evening off with a glass of Metaxa, a traditional Greek brandy strong enough to knock your socks off. A bottle of this will go a long way! So there’s your menu sorted. Now all you need to do is put the finishing touches to your Greek-themed dinner party. Think about decorating your home and get your hands on some traditional Greek music for some authentic background sounds. You can set the scene in many ways and the more you do so, the bigger success your evening promises to be. How to Avoid Poisoning Your Guests!